In 2016, there were over 99,000 hit-and-run crashes in Florida, and half of the 19,000 injured victims were pedestrians. There were 94,000 such accidents in 2015 and 85,000 in 2014. Many of these cases are closed quickly because the driver is apprehended at or near the scene. Other cases drag on for months or even years. In fact, a road ranger was struck and killed on I-275 outside Tampa in 2001, and that case is still unsolved. In the vast majority of these cases, the hit-and-run driver was also the tortfeasor (negligent operator responsible for the crash). However, the way the law is written, victims can also be charged with hit-and-run and face up to five years in prison for a serious injury crash and thirty years for a fatality. Statistics vary by jurisdiction, but in some areas, fewer than one in three drivers who flee the scene of a collision are caught and prosecuted. Fortunately for victims, the percentage is considerably higher in civil court. In nearly all these cases, investigators have virtually nothing to go on, other than the vehicle’s make, model, probable color, and last known direction. Furthermore, especially if the victim was a pedestrian, many law enforcement agencies are not terribly interested in pursuing these cases unless there was a fatality. Most of all, these cases are difficult to prove in criminal court, because of the high burden of proof (beyond a reasonable doubt). Essentially, unless the tortfeasor confesses, prosecutors must produce at least one eyewitness who clearly saw both the driver and the vehicle. Typically, there is no such evidence, because if there were, the driver probably would not have fled in the first place. However, the burden of proof is much lower in civil court (a preponderance of the evidence, which means more likely than not). 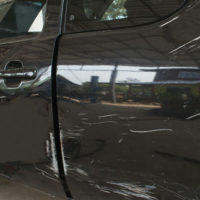 Assume that a personal injury attorney hires a private investigator who discovers that a vehicle matching the vague description of the tortfeasor’s car belongs to Tamera Tortfeasor; many times, these investigators interview owners at area body shops to uncover such information. Unless Tamera has an airtight alibi for the time of the crash, a jury can conclude that, more likely than not, she was the driver and is therefore liable for damages. Many people have considerable respect for Good Samaritans and other people who go out of their way to help injured victims in car crashes. So, it stands to reason that they have considerable disregard for hit-and-run drivers, or people who go out of their way to make victims suffer even more. As a result, many juries award punitive damages in hit-and-run cases. To claim these additional damages, victims must present clear and convincing evidence that the tortfeasor intentionally disregarded a known risk and put the safety and property of other people in jeopardy, and drivers who flee the scenes of serious injury accidents certainly fall into this category. Even if the tortfeasor is not identified for negligence purposes, many victims may file claims against their own insurance companies. Because the company wants to keep a paying customer happy, these cases often settle fairly quickly and on plaintiff-friendly terms. For prompt assistance from an aggressive personal injury lawyer in Brandon, contact Reed & Reed. Attorneys can arrange ongoing medical care for victims, even if they have no money and no insurance.